Got a stump, or maybe a handful of stumps that need removed? 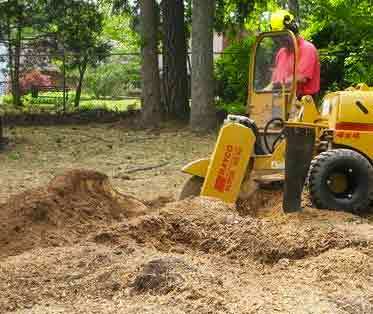 Providing quality stump grinding is at the root of our business! We've got the right equipment and know–how to get the job done right. EnvisiaCare Services also offers tree removal, tree trimming, lawn fertilization and weed control, and most all landscape maintenance. If the old "bird bath stand" is starting to look like an eyesore, or maybe you are tired of tripping over a low–cut stump or surface roots in your yard, then it's time to call the local Cheyenne stump removal experts. From six inches wide to six feet wide, we are equipped to remove any size stump in most any location. We also take the necessary precautions to ensure that no surrounding property is damaged by flying debris and that no damage is done to the surrounding lawn area. 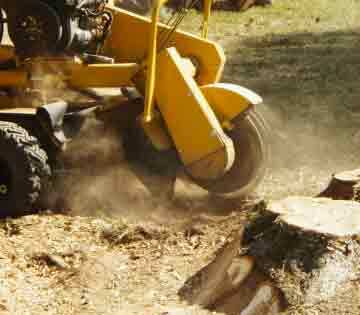 The cost of stump removal ranges depending on the height and width of the trunk, the location, and if we haul of the resulting chips or leave them. Feel free to contact us for a free estimate. Did you know that if you remove a tree in the right–of–way, the City of Cheyenne requires the stump to be ground down at least eight inches below ground level? With certain trees this is necessary to ensure new sprouts won't emerge and cause the same problem again. Other times stump cutting may open up the ground space for the roots of a new tree or plant that can replace old growth, or even new sod.